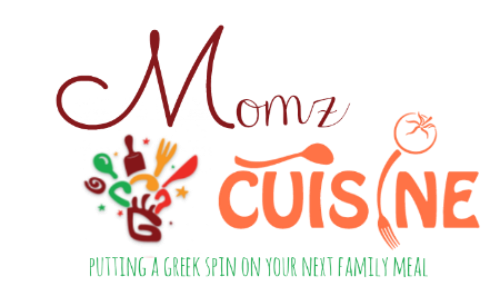 This is a traditional Greek dish and it's served at all local taverns, a famous dish and especially during lent It's a cherished dish with my family.Most people bake them without sauteing the ingredients, I prefer this way, I find that it gives it a better flavor. If you have a Terracotta pan, bake them there, they taste better. 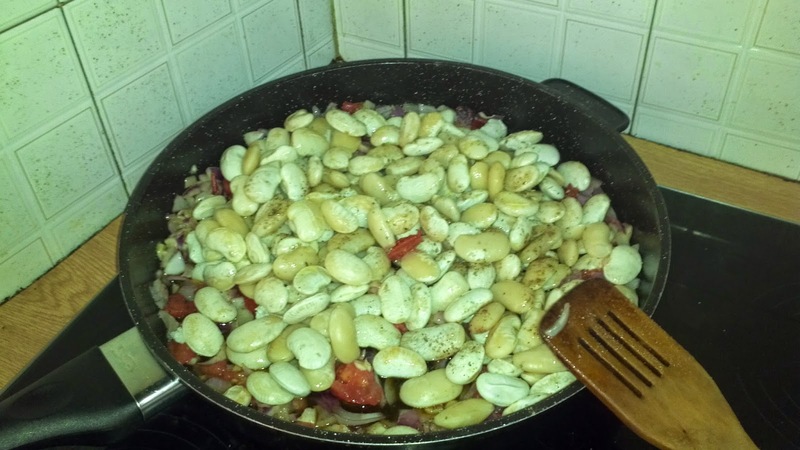 If you can't find Greek large beans ( Yigandes) you can use Lima beans or any large beans that they sell in your area. * Petimezi- this is a thick-non - fermented grape juice. Some people use this so it can give the recipe a tangy sweet taste. You can find this at Greek stores as I have said before, if you live in New York, take a walk down to Astoria, you will find all of your Greek ingredients. I have never used this ingredient, once in a while I might add 1/2 teaspoon of sugar and 2 tablespoons of vinegar. 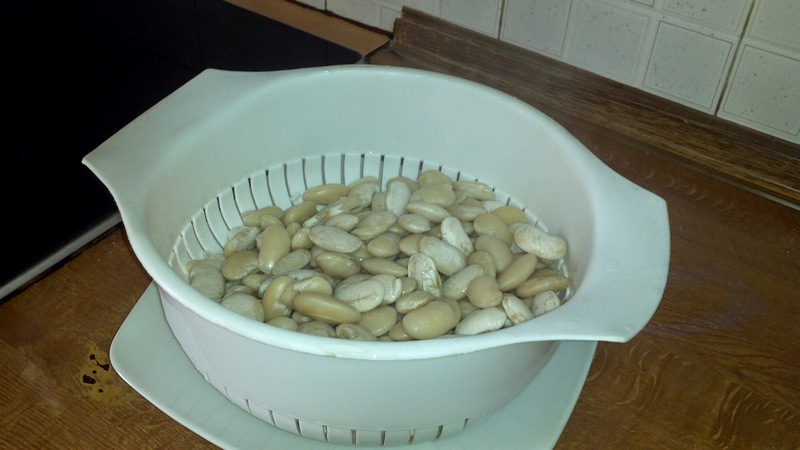 The beans I buy need soaking overnight 8 -12 hours 9 ( this depends on your beans brand) U.S. Lima beans ( equivalent to these large beans) might not need soaking. The next morning drain and wash them. 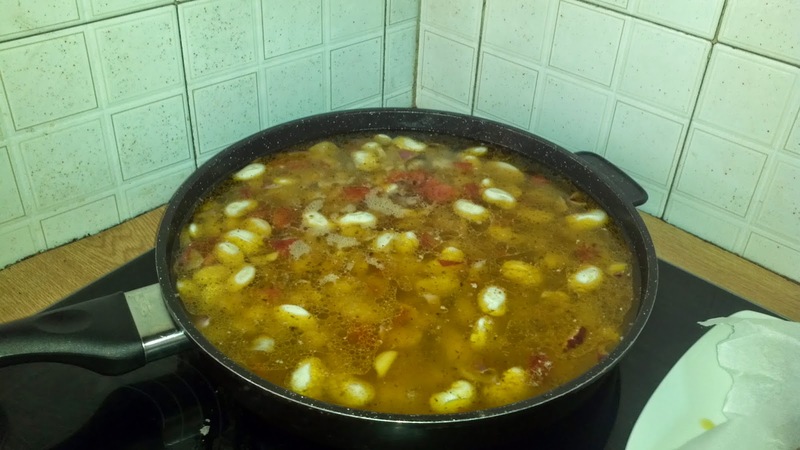 Boil them for 5 minutes, drain and wash them again. 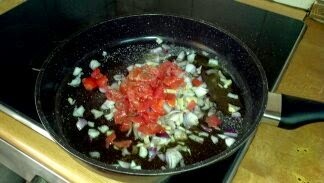 Chop your tomato,onion and garlic into small pieces and place in your pan. Add salt, pepper, olive oil and oregano. 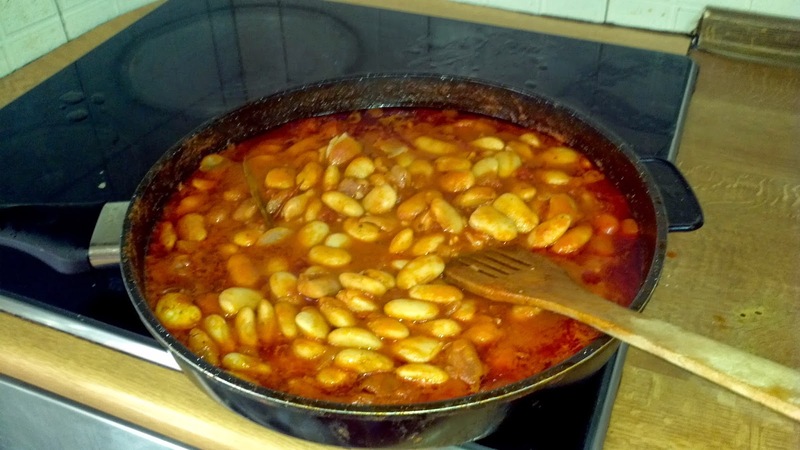 Saute for about 10 minutes then add beans. cook on high heat. Sprinkle fresh oregano. Cook and simmer for about 20 minutes, then add them to your baking pan. 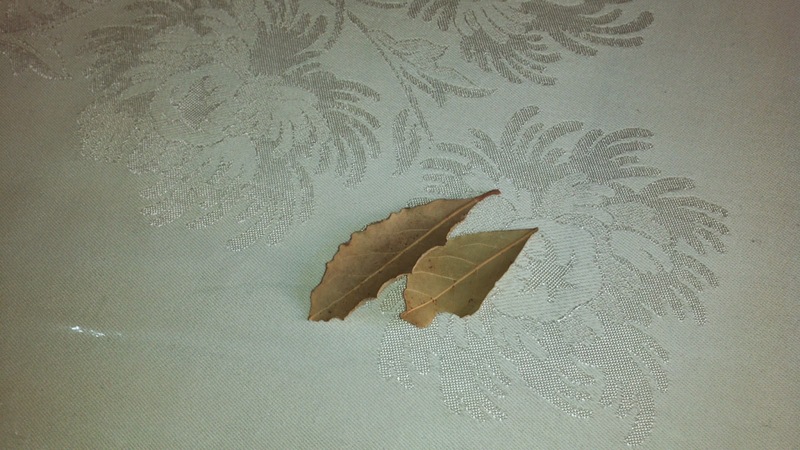 Bake for about 45 minutes at 356, when done take your bay leaves out.They are ready to serve. TIP: When you are baking them cover them with baking paper so they will not burn and turn black.Serve with red semi sweet wine or a tall cold beer which I prefer. Orange juice for the kids and Kale Orexi ! Wow! I absolutely LOVE this dish! As a vegan I am always looking for recipes which have lots of nutrients, especially protein. Awesome! This looks so simple and delish. I love new healthy dishes! Thank you ladies, yes it is very simple, healthy and tasty ! Thank You Lorelai and yes it does smell great !! These sound sooo delicious. 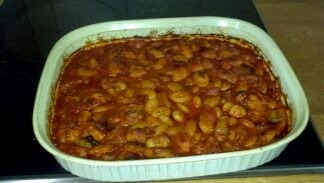 I haven't actually had home cooked beans like this not out of a can. I need to try this. Thank you! Thank You Brie, at and you should see how god they are when you dip Greek bread in the beans. If anyone has any questions feel free to contact me. Oh man, those do look yummy delicious good! We love beans, I've never tried them this way. This looks so great! Love that it's vegan! 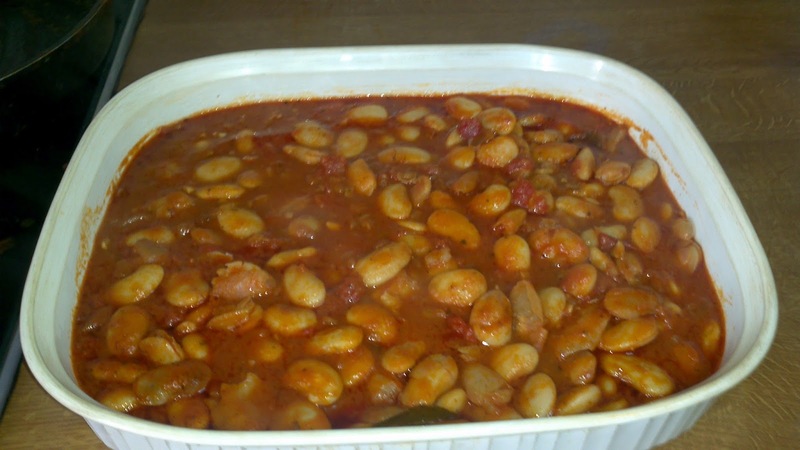 These would be a hit with my family who love bean dishes. Look so scrumptious.